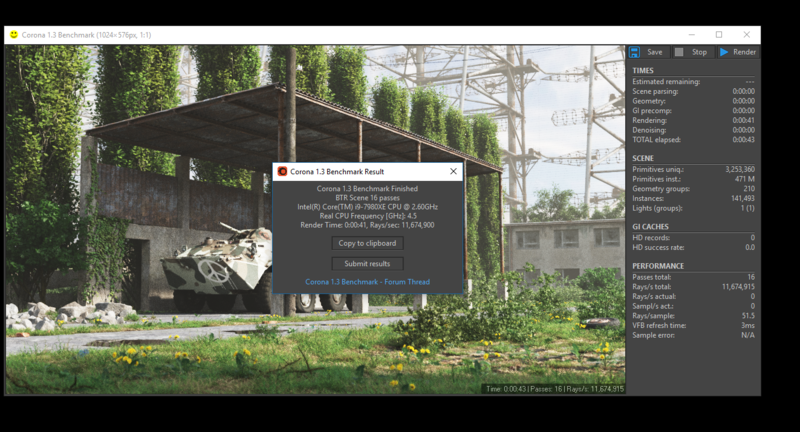 A new CPU benchmark to try. Here is my Render Time 00:08:50.10, Rays/s 916,711 vs. other G4560's. Last edited by Polo6RGTI; 06 Dec 2017 at 15:56. Render Time 00:08:45.56, Rays/s 924,616. Last edited by Polo6RGTI; 06 Dec 2017 at 15:57. Good job, you took out the number 1 for your setup. Did you submit the score online? Good score Mike. Did you submit the score online? Did it but lost the link. Last edited by CountMike; 02 Jul 2018 at 06:03.